White Castle vineyard near Abergavenny has a scheme where you can adopt a vine for your loved-one. That gives them a personalised certificate of adoption valid for a year, a plaque with their name on their adopted vine, a conducted vineyard tour for two people to include a glass of wine to toast the adopted vine, and the chance to join owners Robb and Nicola Merchant at harvest to handpick the grapes from your adopted vine. The package also includes a bottle of wine from your adopted grape variety to take home and a warm welcome to events taking place throughout the year at The Cellar Door.The price is £45.00 Contact Robb or Nicola on 01873 821443 or email: info@whitecastlevineyard.com. See more details here. Book a chocolate tasting and making course at Black Mountain Gold based in Crickhowell. Your loved one can join a three-hour course for £85, or have a one-to-one workshop with master chocolatier Jules for £250. The courses include an introduction to truffle making, tempering, hand rolling and piping ganache, enrobing and detailing, using dipping forks, mouthfeel and cocoa butter, and chocolate moulding techniques. To book and pay for your place please call the shop on 01873 812362. See more details here. Book your Valentine a Welsh fish and shellfish cookery course at Bodnant Welsh Foods at Conwy. The course teaches people how to cook and prepare sustainably-sourced fish and learn techniques such as skinning, filleting and boning. For lunch your Valentine will try the fish and shellfish they have cooked and pair them with matching wines from Bodnant’s onsite wine cellar. The next course is on February 27. Your Valentine will learn to cook lobster bisque, citrus cured salmon, poached pollock and black curry powder, halibut wellington and baked scallops and coconut. The day course costs £115. See more details here. Your Valentine can hone their baking skills at a half day bakes and cakes course at The Culinary Cottage at Pandy, Abergavenny. The course will cover beer and soda bread, sweet and savoury pastries, and a chocolate genache-covered creation. The half day course cost £65. See more details here. Book your Valentine a place at a Weber Essential course at Angela Grey’s Cookery School in Llanerch Vineyard, Vale of Glamorgan. The course teaches American barbecue, low ‘n’ slow cooking and smokehouse cuisine skills, creating deliciously authentic dishes from scratch. Dishes will include barbecued beef brisket and a side of signature slaw, spicy buffalo wings with gorgonzola dip, stacked ribs, and Bourbon and smoked bacon chocolate brownies. During the four hours, your Valentine will get hands on with an array of different meats, expand your cooking repertoire on the barbecue and also use the Weber Smokey Mountain Cooker. The cost is £129. See more details here. Your Valentine will love the vibrant veggie recipes taught at Kather’s Kitchen cookery school in Monmouthshire. The dishes will be seasonal The day course costs £85 per person. Call 01292 650801 to book. See more details here. There’ll be a feast of an event in Conwy this weekend. Gwledd Conwy, or Conwy Feast, will be held in the town on Saturday and Sunday. 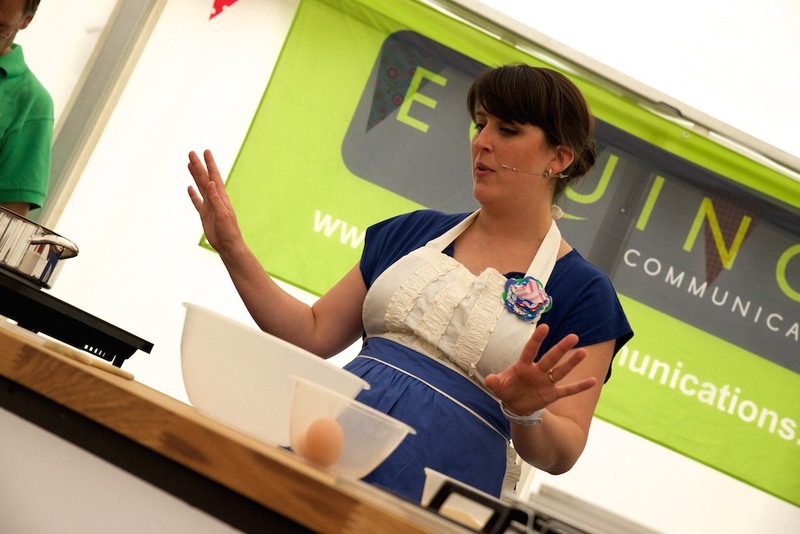 There’s everything a foodie could want on offer – street food, chef demonstrations, a tasting kitchen, and Lancaster Square is the perfect location for Conwy’s local produce market. Meat, fish, fruit, vegetables, cakes, jams, chutneys, eggs, bread, pies, chocolates and cheese will be some of the produce on offer over the weekend. Chefs on the line-up include Lee Watson, the author of the new vegan cookbook ‘Peace and Parsnips’ and one half of the presenting team of 24 Hour Kitchen’s ‘Meat vs Veg’. 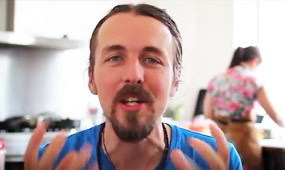 He is a food adventurer who travels the world making vegan versions of local dishes, combining two of his main passions; travel and cooking. Lee is based in North Wales, where he cooks at Trigonos, a retreat centre and organic vegetable farm, and writes the blog The Beach House Kitchen focusing on local, seasonal produce given a regular global twist. Lucknam Park Spa and Restaurant’s Hywel Jones is also set to cook for the crowds, alongside John Williams, who has worked in some of the best hotel and restaurants in Great Britain. 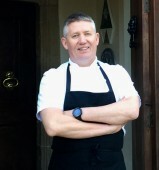 John trained originally in South Wales and Jersey and he became Head Chef at the Old Vicarage Hotel, Worfield, Shropshire, was Head Chef at Bodysgallen Hall between 2003 and 2007 and in this time he achieved and maintained the accolade of 3 rosettes from the AA, and secured Bodysgallen’s highest rating to date in the Good Food Guide. John is also a Master Chef of Great Britain in which he has been awarded a fellowship. There are only 30 or so members of the culinary elite in the UK -the title given to craftsmen who have held a Michelin star and three rosettes for 10 years or more. John Emmerson and Joe Kerswell trained at Jamie Oliver’s Fifteen restaurant in London.The two friends now work together at Anna Hansen’s widely acclaimed restaurant The Modern Pantry in Clerkenwell. John and Joe will be giving a joint demonstration at this year’s Conwy Feast, using classic Welsh ingredients such as Welsh salt lamb or Welsh black beef. The crowds will also see Ian Watson, who started his career as an apprentice at Bodysgallen Hall Hotel. He worked at The St Tudno Hotel in Llandudno for seven years during which time they were awarded three AA Rosettes. Since 2000 he has been the owner chef of Watson’s Bistro in Conwy, from where he has earned a reputation for providing fine cuisine using locally-sourced produce. Weekend ticket: Adult £13, under 16s go free (valid all day Saturday, Saturday night music on the Quayside, all day Sunday). Sunday ticket only: Adults £6.50, under 16s go free. Blaenafon Cheddar Co Ltd http://www.chunkofcheese.co.uk Speciality award winning hand made Welsh cheddar & goats cheeses. Driftwood Designs http://www.driftwooddesigns.co.uk Welsh art with coastal themes. Framed prints, posters and cards.